Generally, we think about our ecological footprint in terms of how our decisions affect the planet, the environmental impact of what we personally own, buy, and throw away. But calculating your footprint and finding ways to reduce it has other consequences you might not have thought of. Try this: take the quick, simple quiz on www.myfootprint.org and see where you stand. After taking the quiz, you have a snapshot image, a mental picture of your ecological footprint. Now, take that mental image, forget about the environment for a moment, and instead focus on how simple your life is. Or rather, how complicated your life is. Imagine ways to reduce your footprint from the perspective of simplifying your life. Think about all the things you own, the money you spend, and what you throw away. Would reducing each of these parts of life make things simpler? If life was simpler, would you have more time and energy to focus on what you want to do, instead of what you have to do? OK, now, still holding that image of your current ecological footprint in your consciousness, forget about the environment, forget about simplicity, and instead focus only on your finances. Think about all the things you own, the money you spend, and what you throw away. 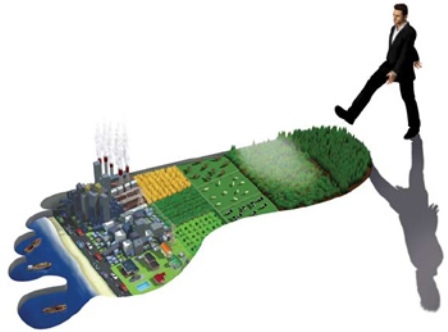 Would your financial situation improve if you focused on reducing your footprint? Would you have more money if you consumed less and had fewer things to maintain, repair, replace, and throw away? By reducing your footprint, you inevitably make your life simpler and less expensive while simultaneously living a more environmentally sustainable lifestyle.